This is an archaeological, architectural and historical study of one of the largest complexes of buildings in the medieval City of London, but one which is largely unknown and of which only two fragments survive above ground today. 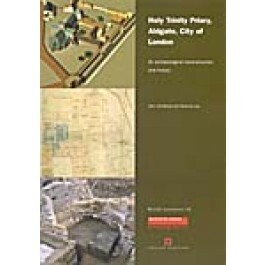 It is the fifth volume in a series on the monasteries of London. Holy Trinity Priory, Aldgate, was the first religious house to be established inside the walls of London after the Norman Conquest, in 11078; one of the earliest Augustinian houses to be established in England; and the first to be dissolved, in 1532. By 1200 the precinct north of Leadenhall Street and just inside Aldgate was filled with imposing stone buildings, including a large and architecturally impressive church which was the burial place of two of the children of King Stephen in the middle of the 12th century. Londons first mayor, Henry FitzAilwin, was buried in the entrance to the chapter house. In the 16th century the monastery was owned by the Duke of Norfolk, second only to Queen Elizabeth in power, who was executed in 1572 for his part in plots surrounding Mary Queen of Scots. Several modern excavations of 1977 to 1990, many antiquarian drawings, and a ground-floor and a first-floor plan of all the monastery buildings made around 1585 are brought together here for the first time, to reconstruct a fully illustrated and detailed history and archaeology of the priory site. Not only can all the major periods of the priorys building history be suggested and compared with other religious houses in medieval London, but the excavations produced their own surprises, such as evidence of the beginning of the tin-glazed or delftware pottery industry in the 1590s, and a unique Jewish plate of the 18th century.